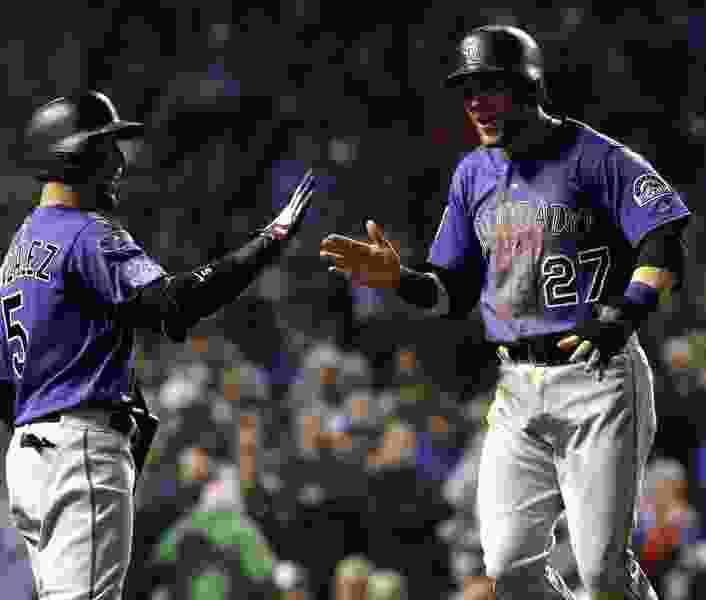 Chicago • Tony Wolters hit a tiebreaking single with two outs in the 13th inning and the Colorado Rockies beat the Chicago Cubs 2-1 on Tuesday night in an epic NL wild-card game. In the longest win-or-go-home postseason game in major league history, Wolters entered as part of a double switch in the bottom of the 12th. The reserve catcher came up with runners at the corners and drove in Trevor Story with a liner back up the middle off losing pitcher Kyle Hendricks, quieting the crowd of 40,151 on a crisp fall night. After playing its third big game over three days in three different cities, Colorado now heads to Milwaukee to open a best-of-five Division Series against the NL Central champion Brewers on Thursday at Miller Park. Scott Oberg, the sixth Colorado pitcher, fanned Kris Bryant for the final out of the 12th and then struck out the side in the 13th to end the longest postseason game in Wrigley Field history. Terrance Gore tried to sell that he was hit by a pitch, but was sent back to the plate after a replay review confirmed the initial call. After Albert Almora Jr. struck out swinging for the final out, Wolters ran out and grabbed Oberg. They were soon joined by the rest of the excited Rockies in a rollicking purple mob near the mound. Wolters’ clutch swing in his playoff debut and Oberg’s relief effort won it for the Rockies. Previously, the longest win-or-go-home games in the postseason were 12-inning affairs in the 2014 AL wild-card round and Game 7 of the 1924 World Series. It had pretty much everything, too. Hendricks was the third starting pitcher used by the Cubs, after Jon Lester worked six solid innings and Cole Hamels was pressed into action after the teams were tied at 1 after nine. Rockies third baseman Nolan Arenado exchanged a memorable hug with Javier Baez after he tagged the excitable Cubs star in the 11th. Colorado moved on to the Division Series for the first time since 2009. The Rockies, who lost to Arizona in the wild-card game a year ago, will face NL Central champion Milwaukee in Game 1 on Thursday at Miller Park.